The Dong Nai Port Development JSC many times urged the Ministry of Transport and Vinalines to remove the dock out of the Go Dau port waters after seven years of staying there. Binh said that he knows a 1,000 ton freighter used in construction of the island is still on Da Lat Island. “I just want to say that M83 can be used for many purposes. It can be exploited as a floating storehouse, or a place at sea to help fishermen,” he commented. “We will find many ways to take full advantage of the floating dock if we really intend to try it,” he added. 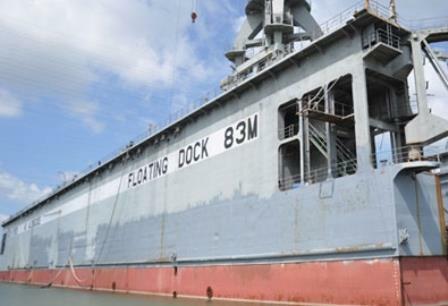 Lieutenant General Nguyen Van Rinh from the Ministry of National Defence also noted that in principle, old ships and flocking docks can be exploited for sovereignty protection on the East Sea and economic development. “We can build a platform for troop deployment or create artificial places for docking, such as floating houses,” Rinh said. He said that all measures that do not violate international laws and are applied within the territorial sovereignty of Vietnam can be deployed. M83 is worthless in businessmen’s eyes and it would be just scrap iron if it continued to be left idle. However, it will become valuable if it is modified to become a floating platform. It can also be transferred to enterprises that build fishing boats for use or exploit near the shore. The Ministry of National Defence has built DK1 rigs, called ‘magic eyes’, on the coral sandbank of Truong Sa Archipelago. The rig helps protect Vietnam’s sovereignty over the archipelago. Binh said that not only a floating dock but old ships can also be exploited instead of being demolished and sold as scrap iron. One of the solutions is to turn the old ships into boarding training schools for maritime practitioners, or develop them into tourist centers to receive visitors. This has been applied in some regional countries.